1) In response to feedback I’ve received from several quarters, I’ve added a critical hit chart that follows the conventions of v2. This means that you now have the option of downloading a chart for both my effects and Josef’s effects whose crits get nastier the lower you roll, just like the chart found in the core book. Of course, you can still download the old, ascending charts (still my favorite!). 3) Joseph has added a new critical hit chart specifically designed for use during combats with large monsters. Take a look, it’s available now. It’s been a while since I updated last and I figured you might want to know what I’ve been up to. 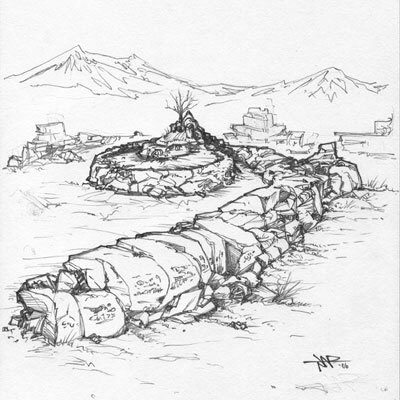 Between adding and revising entries for the Firearms Criticals I’ve been working on a larger project: a v2 campaign called, coincidentally enough, “Winds of Chaos.” TJ Adamowicz, the artist who provided the sketches for Noblesse Oblige, is hard at work doing the same thing for “Of Stones & Sigils,” the campaign’s first installment. What is that, you may ask? Why, a sigil, of course. Maybe we’ll get to see the “Stone” portion of the title at a later date. You are currently browsing the Winds of Chaos weblog archives for August, 2006.